Integrity Building Inspections - RADON INFORMATION What is Radon and where does it come from?Radon is a naturally occurring, odorless, tasteless, colorless, inert radioactive gas. It is produced by the natural decay of Uranium to Radium in the soil and rocks. Because it is an inert gas, it travels freely through rocks and soil and eventually through basement cracks and openings into most homes. Your home foundation and basement has a larger contact with the source of natural radon so it usually has the highest concentration of radon. The Environmental Protection Agency State Residential Radon Surveys of homes in Kansas and Missouri indicated 25% of homes in Kansas and 17% of the homes in Missouri exceeded the EPA action level of 4pCi/L. Jackson County Missouri and Johnson County Kansas has averages higher than the state average and are listed as the highest areas for Radon in the USA (averages over 4.0 in homes). It is also estimated that 21,000 people this year in the USA will die from Radon related lung cancer. Radon is a Class A or Group 1 known carcinogen (highest risk group) by the International Agency for Research on Cancer. Radon has an atomic number of 86 with 39 known isotopes. Most attention is given to two isotopes of Radon: Radon 220 (Thoron) and Radon 222. Since the half life of Radon 220 (Thoron) is only about 56 seconds the chance that it will decay near or in a person’s lungs is more remote. It will normally decay while still in the rocks and soil so most of our health risk and concern comes from Radon 222 and its decay products. Radon 222 is an unstable radioactive inert gas that will breakdown with a half life of approximately 3.8 days. How Does Radon Induce Lung Cancer?Each time a Radon atom decays it emits radiation in the form of particles and energy while changing into a radiation decay product. It is mainly these decay products of radon gas that pose the highest health risk. They are more dangerous than the Radon gas itself. These decay products are charged heavy metal atoms (no longer an inert gas) that will plate out or stick to almost any surface or molecule they come into contact with including dust or moisture floating in the air. When inhaled (from normal breathing), they will stick to your lung tissue. These Radon decay products have very short half lives and will decay very quickly and release their radiation while in direct contact with your lung tissue. It is the alpha particles that pose the highest health risk (2 neutrons and 2 protons with gamma radiation) but all forms of the radiation released (Alpha, Beta, and Gamma) from Radon and Radon decay products can initiate the process of carcinogenesis. Alpha particles can literally break the DNA apart inside your living cells. Other radiation particles or energy can cause changes in the chemical nature inside the cell. All of these changes can cause the cancer. What is The Evidence for Radon risk?There is more evidence and studies about the health risk of radon exposure than almost any other human carcinogen. Our government regulates known carcinogens when there is a 1 in 1,000,000 chance. Radon has been proven to have a much higher chance for causing Lung cancer – if a home has 4pCi/L of Radon (4 pico curies of radon in a cubic liter of air ) the risk of getting lung cancer from Radon for a non-smoker is 7 in 1000 and for a smoker it is 62 in 1000 people (New revised risk assessment from MURC-UMn 2009). Miners exposed to Radon as low as 40 WLM (working level months) have a risk from Radon exposure. People living in homes at the 4pCi/L (EPA’s recommended action level) can receive a calculated 54 WPM (working level months) over a lifetime. For this reason EPA and the Surgeon General recommend that people not have long term exposures to Radon above 4pCi/L. Homes with levels at or below 4pCi/L are NOT safe but are known to be below a certain risk level. It is possible to reduce the Radon in most homes to below 2pCi/L a far safer exposure than the current EPA action level. For more information please go to www.epa.gov/radon and obtain the Citizen’s Guide to Radon EPA 402K-09-001 and other information and documents. What does 4pCi/L really mean?4pCi/L stands for 4 pico curies of radiation in one cubic liter of air. One pico Curie is one trillionth of a Curie or .037 atom decays per second. There are 60 seconds in a minute so 60 X .037 = 2.22 decays per minute. So at one pico curie per liter there will be 2.22 atom decays every minute, an extremely low level. At the EPA action level of 4pCi/L there are just 8.88 atom decays in a cubic liter of air every minute. Thus in a 1000 square foot home with 4pCi/L there will be about 2 million radioactive decays per minute. Can High Radon Levels Be Reduced?Yes. By using a state licensed or National Radon Proficiency Program (NRPP) certified contractor, Radon levels can easily and affordably be reduced. There are both passive and active systems for reducing Radon in homes. Most mitigation (radiation reduction) techniques involve sealing cracks, gaps, and the sump pump drain system in the home’s basement, then preventing radon from entering by drawing the radon from below the house through vents installed below the basement concrete floor and allowing it to exhaust above the roof into the air where it quickly disperses. Active systems usually use a small fan to maintain a negative suction condition below the home basement or a sealed crawlspace level. For more information please go to www.epa.gov/radon and obtain Radon Mitigation Standards EPA 402R-93-078. How is Radon Detected?Radon can be detected by many methods. The few most common methods are: Active continuous monitors: The most common continuous monitoring detectors are sensitive to the alpha particles produced as the Radon gas decays. They count and record the number of decays observed by using ion chambers or solid state silicone detectors. EPA protocols require a monitor to record the data every hour for a minimum of 48 hours using closed house conditions as the minimum period for real estate transactions. Results from continuous monitor detectors can be downloaded immediately so they are often the preferred method for quick and accurate results. This is the only method of Radon detection where the use of a single detection device is allowed under EPA protocols and Kansas Law for real estate contracts and is the method used by Integrity Building Inspections.Passive activated charcoal: This method uses activated charcoal to adsorb the Radon for a period of time then sealed and shipped off to a laboratory for testing of the Radon decay products left in the charcoal. Since charcoal absorbs moisture this type of test is normally short range only. Charcoal devices are also biased toward the end of the test period. They are sensitive to air flow and temperature extremes. They are not a true integrating test device and will be biased especially if Radon levels vary dramatically during the test period. EPA protocols require two tests conducted either together or sequentially using charcoal testing methods. These tests also require a minimum 48 hour test period using closed home conditions for real estate transactions. Since the test kits must be shipped off to an outside lab for testing, the results are not immediate and there is a time delay of several days.Passive electret ion chamber: This method uses an electrostatic charged disk (electret) that has its voltage read before and after the test to determine how much voltage was lost due to electrons absorbed on its surface due to ionization process of Radon decay and Radon decay products. It measures alpha, beta, and majority of gamma radiation inside its chamber. It is also sensitive to turbulence and air movement. Since gamma radiation goes through almost anything, it is subject to background or external gamma radiation (especially at higher elevations). EPA protocols require two tests either performed together or sequentially using electret ion methods. These tests also require a minimum 48 hour test period using closed home conditions for real estate transactions. Voltage drop on the electrets can be read immediately and adjusted for background radiation so there is no delay in obtaining the results using this method.Alpha tract detector: This device records alpha particle tracks or damage on a piece of plastic or film. Due to lower sensitivity, these devices are used for longer testing periods (3 months to 1 year). Since it is a passive device it is sensitive to air movement or a breeze. Because it is used over a longer period, this type of test gives a better representation of actual average Radon conditions which can vary from season to season. Closed house conditions do not have to be maintained for these longer time periods. The device is sent to a laboratory that reads the number of tracks or damage produced on the film during the time exposed and calculates the average Radon level. Who can measure Radon?At the present time there are no laws concerning who can test for Radon in Missouri. In the State of Kansas a law went into effect July 1, 2011 regarding measurement and mitigation providers. Gary Martin with Integrity Building Inspections is licensed by both KDHE and NRPP. The Kansas State University is part of the Midwest Universities Radon Consortium along with the University of Minnesota for administering NRPP certifications. 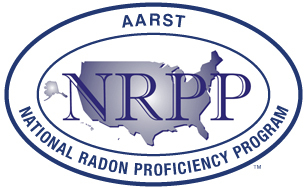 EPA and Kansas have recognized two Radon Certification Programs in the US: National Radon Proficiency Program (NRPP) US EPA selected pilot Radon Proficiency Program when under NEHA. Now Administration by AARST www.aarst.org . National Radon Safety Board Independent Radon proficiency program www.nrsb.org Radon technicians should be certified and licensed by either your State or by one of these two Radon certification programs or both. Gary Martin with Integrity Building Inspections is CERTIFIED with NRPP ID # 105598RT for both measurement and analysis of the results and with State of Kansas KDHE # KS-MS-0057. There are only 24 people with both required certifications in the Kansas City area - everyone else should be sending their results out to a third party for analysis*. Make sure your measurement provider has both Standard (S) and Analytic (A) certifications with their certification organization. There is more than one type of certification. * As of August 2014Gary is also CERTIFIED with NRPP for Radon Mitigation ID # 106196RMT and holds State of Kansas KDHE certification for Radon Mitigation # KS-MI-0013. Integrity Building Inspections is Certified and performs all Radon Tests in accordance with NRPP, EPA protocols, and Kansas State KDHE regulations on both methods and testing device types. We use continuous Radon monitors manufactured by Sun Nuclear Corporation, with device type performance tested at Bowser-Morner, Inc. We require a signed Consent to Test Agreement from the home occupant or owner in accordance with NRPP and EPA protocols. These rigid standards are to insure proper equipment and methods are used, conditions are maintained in the home for short term testing, insure against tampering with the test equipment and test results, and to allow building access to set up and pick up test equipment or devices. If you have any questions about Radon testing or mitigation, please do not hesitate to contact us at 816-922-9529. We are in business to help. Radon is a naturally occurring, odorless, tasteless, colorless, inert radioactive gas. It is produced by the natural decay of Uranium to Radium in the soil and rocks. Because it is an inert gas, it travels freely through rocks and soil and eventually through basement cracks and openings into most homes. Your home foundation and basement has a larger contact with the source of natural radon so it usually has the highest concentration of radon. The Environmental Protection Agency State Residential Radon Surveys of homes in Kansas and Missouri indicated 25% of homes in Kansas and 17% of the homes in Missouri exceeded the EPA action level of 4pCi/L. Jackson County Missouri and Johnson County Kansas has averages higher than the state average and are listed as the highest areas for Radon in the USA (averages over 4.0 in homes). It is also estimated that 21,000 people this year in the USA will die from Radon related lung cancer. Radon is a Class A or Group 1 known carcinogen (highest risk group) by the International Agency for Research on Cancer. Radon has an atomic number of 86 with 39 known isotopes. Most attention is given to two isotopes of Radon: Radon 220 (Thoron) and Radon 222. Since the half life of Radon 220 (Thoron) is only about 56 seconds the chance that it will decay near or in a person’s lungs is more remote. It will normally decay while still in the rocks and soil so most of our health risk and concern comes from Radon 222 and its decay products. Radon 222 is an unstable radioactive inert gas that will breakdown with a half life of approximately 3.8 days. Each time a Radon atom decays it emits radiation in the form of particles and energy while changing into a radiation decay product. It is mainly these decay products of radon gas that pose the highest health risk. They are more dangerous than the Radon gas itself. These decay products are charged heavy metal atoms (no longer an inert gas) that will plate out or stick to almost any surface or molecule they come into contact with including dust or moisture floating in the air. When inhaled (from normal breathing), they will stick to your lung tissue. These Radon decay products have very short half lives and will decay very quickly and release their radiation while in direct contact with your lung tissue. It is the alpha particles that pose the highest health risk (2 neutrons and 2 protons with gamma radiation) but all forms of the radiation released (Alpha, Beta, and Gamma) from Radon and Radon decay products can initiate the process of carcinogenesis. Alpha particles can literally break the DNA apart inside your living cells. Other radiation particles or energy can cause changes in the chemical nature inside the cell. All of these changes can cause the cancer. What is The Evidence for Radon risk? There is more evidence and studies about the health risk of radon exposure than almost any other human carcinogen. Our government regulates known carcinogens when there is a 1 in 1,000,000 chance. Radon has been proven to have a much higher chance for causing Lung cancer – if a home has 4pCi/L of Radon (4 pico curies of radon in a cubic liter of air ) the risk of getting lung cancer from Radon for a non-smoker is 7 in 1000 and for a smoker it is 62 in 1000 people (New revised risk assessment from MURC-UMn 2009). Miners exposed to Radon as low as 40 WLM (working level months) have a risk from Radon exposure. People living in homes at the 4pCi/L (EPA’s recommended action level) can receive a calculated 54 WPM (working level months) over a lifetime. For this reason EPA and the Surgeon General recommend that people not have long term exposures to Radon above 4pCi/L. Homes with levels at or below 4pCi/L are NOT safe but are known to be below a certain risk level. It is possible to reduce the Radon in most homes to below 2pCi/L a far safer exposure than the current EPA action level. For more information please go to www.epa.gov/radon and obtain the Citizen’s Guide to Radon EPA 402K-09-001 and other information and documents. What does 4pCi/L really mean? 4pCi/L stands for 4 pico curies of radiation in one cubic liter of air. One pico Curie is one trillionth of a Curie or .037 atom decays per second. There are 60 seconds in a minute so 60 X .037 = 2.22 decays per minute. So at one pico curie per liter there will be 2.22 atom decays every minute, an extremely low level. At the EPA action level of 4pCi/L there are just 8.88 atom decays in a cubic liter of air every minute. Thus in a 1000 square foot home with 4pCi/L there will be about 2 million radioactive decays per minute. Can High Radon Levels Be Reduced? Yes. By using a state licensed or National Radon Proficiency Program (NRPP) certified contractor, Radon levels can easily and affordably be reduced. There are both passive and active systems for reducing Radon in homes. Most mitigation (radiation reduction) techniques involve sealing cracks, gaps, and the sump pump drain system in the home’s basement, then preventing radon from entering by drawing the radon from below the house through vents installed below the basement concrete floor and allowing it to exhaust above the roof into the air where it quickly disperses. Active systems usually use a small fan to maintain a negative suction condition below the home basement or a sealed crawlspace level. For more information please go to www.epa.gov/radon and obtain Radon Mitigation Standards EPA 402R-93-078. Active continuous monitors: The most common continuous monitoring detectors are sensitive to the alpha particles produced as the Radon gas decays. They count and record the number of decays observed by using ion chambers or solid state silicone detectors. EPA protocols require a monitor to record the data every hour for a minimum of 48 hours using closed house conditions as the minimum period for real estate transactions. Results from continuous monitor detectors can be downloaded immediately so they are often the preferred method for quick and accurate results. 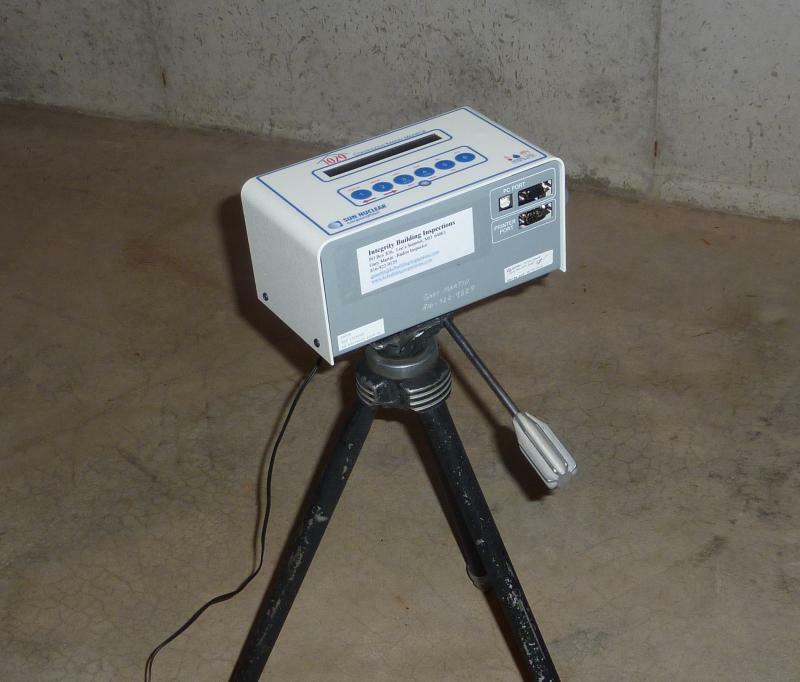 This is the only method of Radon detection where the use of a single detection device is allowed under EPA protocols and Kansas Law for real estate contracts and is the method used by Integrity Building Inspections. Passive activated charcoal: This method uses activated charcoal to adsorb the Radon for a period of time then sealed and shipped off to a laboratory for testing of the Radon decay products left in the charcoal. Since charcoal absorbs moisture this type of test is normally short range only. Charcoal devices are also biased toward the end of the test period. They are sensitive to air flow and temperature extremes. They are not a true integrating test device and will be biased especially if Radon levels vary dramatically during the test period. EPA protocols require two tests conducted either together or sequentially using charcoal testing methods. These tests also require a minimum 48 hour test period using closed home conditions for real estate transactions. Since the test kits must be shipped off to an outside lab for testing, the results are not immediate and there is a time delay of several days. Passive electret ion chamber: This method uses an electrostatic charged disk (electret) that has its voltage read before and after the test to determine how much voltage was lost due to electrons absorbed on its surface due to ionization process of Radon decay and Radon decay products. It measures alpha, beta, and majority of gamma radiation inside its chamber. It is also sensitive to turbulence and air movement. Since gamma radiation goes through almost anything, it is subject to background or external gamma radiation (especially at higher elevations). EPA protocols require two tests either performed together or sequentially using electret ion methods. These tests also require a minimum 48 hour test period using closed home conditions for real estate transactions. Voltage drop on the electrets can be read immediately and adjusted for background radiation so there is no delay in obtaining the results using this method. Alpha tract detector: This device records alpha particle tracks or damage on a piece of plastic or film. Due to lower sensitivity, these devices are used for longer testing periods (3 months to 1 year). Since it is a passive device it is sensitive to air movement or a breeze. Because it is used over a longer period, this type of test gives a better representation of actual average Radon conditions which can vary from season to season. Closed house conditions do not have to be maintained for these longer time periods. The device is sent to a laboratory that reads the number of tracks or damage produced on the film during the time exposed and calculates the average Radon level. US EPA selected pilot Radon Proficiency Program when under NEHA. Now Administration by AARST www.aarst.org . Radon technicians should be certified and licensed by either your State or by one of these two Radon certification programs or both. Gary Martin with Integrity Building Inspections is CERTIFIED with NRPP ID # 105598RT for both measurement and analysis of the results and with State of Kansas KDHE # KS-MS-0057. There are only 24 people with both required certifications in the Kansas City area - everyone else should be sending their results out to a third party for analysis*. Make sure your measurement provider has both Standard (S) and Analytic (A) certifications with their certification organization. There is more than one type of certification. Gary is also CERTIFIED with NRPP for Radon Mitigation ID # 106196RMT and holds State of Kansas KDHE certification for Radon Mitigation # KS-MI-0013. Integrity Building Inspections is Certified and performs all Radon Tests in accordance with NRPP, EPA protocols, and Kansas State KDHE regulations on both methods and testing device types. We use continuous Radon monitors manufactured by Sun Nuclear Corporation, with device type performance tested at Bowser-Morner, Inc. We require a signed Consent to Test Agreement from the home occupant or owner in accordance with NRPP and EPA protocols. These rigid standards are to insure proper equipment and methods are used, conditions are maintained in the home for short term testing, insure against tampering with the test equipment and test results, and to allow building access to set up and pick up test equipment or devices. If you have any questions about Radon testing or mitigation, please do not hesitate to contact us at 816-922-9529. We are in business to help. Please contact Gary Martin, a NRPP Certified and Kansas State University CE trained Radon inspector and mitigator at Integrity Building Inspections at 816-922-9529 if you want to schedule a Radon Inspection or have questions on the process. If you want to schedule Gary for Radon education, training, or demonstrations for your group or class, just e-mail or call. Gary has held many training sessions to help inform the public about Radon and it's risks.